Whether you’re escaping to the countryside or enjoying a relaxing break on the Northumberland Coast AONB, getting back in touch with nature means that you can take full advantage of this picturesque region. That’s why today, the local experts from Cottages in Northumberland are bringing you a handful of hiking routes in the region that you should experience this year. It’s not just people who love this landscape. It’s the perfect place for our four-legged friends to enjoy as well. So, whether you’re a family of avid hikers or you’re looking for somewhere new for you and your best friend, our dog-friendly guide is sure to give you all the inspiration you need for planning your UK staycation this summer. Home to everything from the biggest human-made reservoir and woodland in Europe to its own unique observatory, Kielder Water and Forest Park is a much-loved gem in Northumberland National Park. Everything about this area is dedicated to conservation of wildlife, meaning you can get closer to nature than ever before. 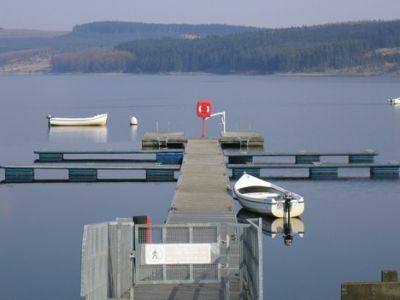 There’s no shortage of walking routes to explore in Kielder, so whether you head along the waterside or into the woods, there’s always an adventure awaiting you and your dog in this remote park. The 694 bus from Hexham to Kielder runs on Tuesdays and Fridays, and you can view the schedule here. Situated between Teesside and the North York Moors, Roseberry Topping is a natural landmark boasting unbeatable views across the rolling hills of North Yorkshire and Cleveland from the summit. With ample Arriva bus services running through Great Ayton, and a daily train service running from Middlesbrough, travelling in the area couldn’t be easier. And the award-winning King’s Head warmly welcomes walkers and pets with its hearty home-cooked meals and local real ales, so rest assured that you can catch your breath in comfortable surroundings after traversing the spectacular bluebell woods or climbing this distinctive 1,050 foot peak. 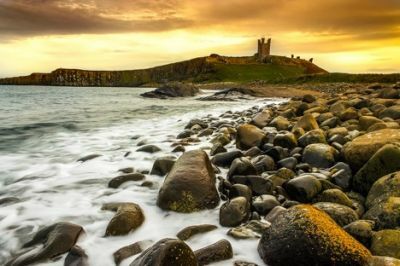 Dunstanburgh Castle is just a 7.5 mile trek from the picturesque fishing village of Craster, so make sure that you catch the impressive view of this 14th century fortress as you make your way along this section of the Northumberland Coast. With Craster easily accessible by bus from Newcastle, Bamburgh and Alnwick, and with the Alnwick and Alnmouth railway station nearby, there’s every reason to add this shoreline hike to your North East itinerary. After imagining what life was like in this historic site, pass by the traditional links golf course and concrete bunkers on the golden sands of Embleton Bay. With the quaint village of Low Newton home to two luxurious pubs, there’s plenty of choice when it comes to finding somewhere for you and your four-legged friend to pause before returning via Duncan Steads. Nestled in the heart of the Northumberland countryside, Rothbury is a historic rural town that’s known to locals as the Capital of Coquetdale. With Arriva bus routes passing through the town, Rothbury is the perfect base for taking a hike through the Northumberland National Park and Simonside Hills. This distinctive hill range provides an impressive backdrop to the quaint town – although you might want to keep your dog on a lead as you keep an eye out for the red grouse and wild goats that live on these unspoilt sandstone ridges. Jess Sheldon is a content writer at Cottages in Northumberland, providing visitors to the region with home-from-home holiday cottages in Alnwick, Bamburgh and surrounding areas.